Is video blogging on your to-do list? Are you nervous that you don’t have the right equipment? I am so excited to share these video blogging tips with you that I just couldn’t wait until Tuesday. So many of you have been commenting that video blogging has made your to-do list this year. I wanted to make sure that you have all the tools needed to get started. A few months back, I started a video blogging series. These video blogs are being posted on the last Tuesday of every month. My goal is to experiment on whether or not video blogging is worth your time. Over the past two and half months, I have been researching, experimenting, and discovering what it really means to post a video blog. Every month, I seem to run into a different hiccup. The first month, I accidentally posted the video straight to Google+ without being able to edit it. Last month, I had some background noise trouble. Every time it’s something. It has been both frustrating and fun. I will also say that I am spending a lot more time creating video blogs than I would if I was writing the content. It’s the same when I start working with a new client. I spend more time in the beginning, learning about the company and niche. Eventually, I am able to work more quickly and the time commitment goes down. 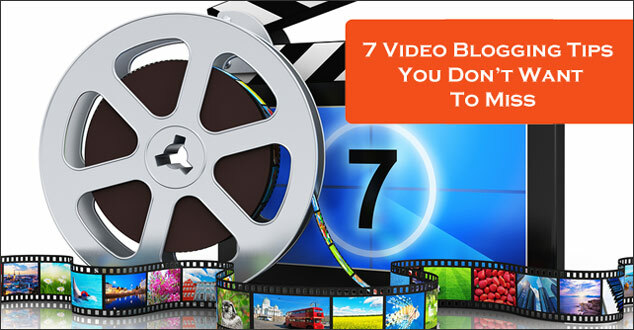 Here are 7 tips that you don’t want to miss, especially if you are starting to video blog this year. This was the tip I needed to hear. I kept pushing video blogging off. Video blogging is going to be just as scary tomorrow as it is today. You don’t need to have any fancy equipment either. I am currently using iMovie on my MacBook Pro. I’ve read that it is a good idea for PC user to use Windows Movie Maker. You could also use Flip Mino. Your equipment doesn’t have to be fancy unless you want it to be. Yes, we will have to add writing to our video blogs. We do this to emphasize the point we are making, for our readers who would like to have an outline to reference and for search engine optimization. You can make it super easy and add bullet points, or you can write a transcript of what you have said on the video. Have fun with it. Laugh at yourself and most importantly give yourself a break. If it were easy, you would have done video blogs years ago. Here is a classic, yet really useful tip: the light goes in front of you and not behind you. Last month, I published a video blog that was over 5 minutes long. I had a lot of information that I wanted to share, but I didn’t need to make it into one video. I could have done it in segments. Five minutes is long to watch and takes longer to shoot. My suggestion is around 3 minutes depending on the type of video you are doing. I have heard suggestions for shorter and I’ve heard longer. So while I still suggest 3 minutes, keep in mind the content you are producing. It may need more time, like in the case of a tutorial, or like mine which was answering someone’s question. The content may also need less time, like if you are asking your readers a question. If you chose to do a video blog where you are filming yourself, don’t forget that you are a part of your brand. If you’re providing cooking tips, consider filming yourself in the kitchen. If you’re a web designer, you might like to film yourself in your cool, modern office. I filmed myself in my favorite chair that I love to write in. So, don’t forget to smile. Have you been video blogging? What is your top tip? I would love to hear your thoughts. Please let me know in the comment section below. It wasn’t on my list but might make it. After all, I am blogging and have been creating videos. Will pay more attention to your experience, tips and other info and who knows. I like reading aloud, comfortable in front of the camera, have an Imac. Thanks for putting this idea in my head. It sounds like you are already to go with video blogging. 🙂 Good luck, I know you’ll be great. Christine – sound, practical advice here. Having disliked being on film it was with trepidation that we embarked on making videos 2 years ago. 140 videos later and over 250,000 YouTube views, we can definitely say IT HAS BEEN WORTH IT. We’ve seen huge benefits on SEO let alone all the other stuff. I agree. Just Do it! I have been making video tutorials, but haven’t added them to my blog yet – so far just on Youtube and Facebook. One thing I learned it to make an outline, not a script. For me, reading the script sounded to scripted. I am much better just knowing the content and direction I am headed and talking. Love the smile quote! What great advice! Thank you so much for sharing. I’ve been video blogging for a few months now – and it has certainly gotten easier! I now shoot 3 – 5 videos at a time, so I can edit them all at once. I also tend to shoot videos on the days I have a networking event or client appointment, as that’s when I’m dressed nicer and have spent extra time on my hair and makeup! Thanks for the tips! These are awesome tips! Video blogging is for sure on my 2014 to list, in fact I’m supposed to air my 1st video by feb 3rd. That’s the deadline I gave to myself so your tips come at the perfect time. Thanks for sharing! I’m still working on the video part, I guess I’m to shy to the camera, but I need to overcome this fear to record a video for my blog. I guess my readers want to see a face, and hear a voice behind all my homeschooling, traveling or even my tips in parenting. Thank you for the encouragement. You are so welcome! If I’m honest I still haven’t gotten over my camera shyness but instead I’ve learned to laugh at myself. 🙂 Good luck with your videos, I’m sure they will be wonderful. I agree with your “Just Do it!” attitude. My goal this year was to start doing more videos because it’s so much more personal than blogging and writing. I just use the webcam on my laptop & I edit minimally. Before the video, I write down my main idea & the points I want to make. For the most part it works well. These are awesome tips, Christine! I’ve been doing how-to videos so far. I would like to do more videos with me on camera in the future but haven’t gotten them in the plan yet.